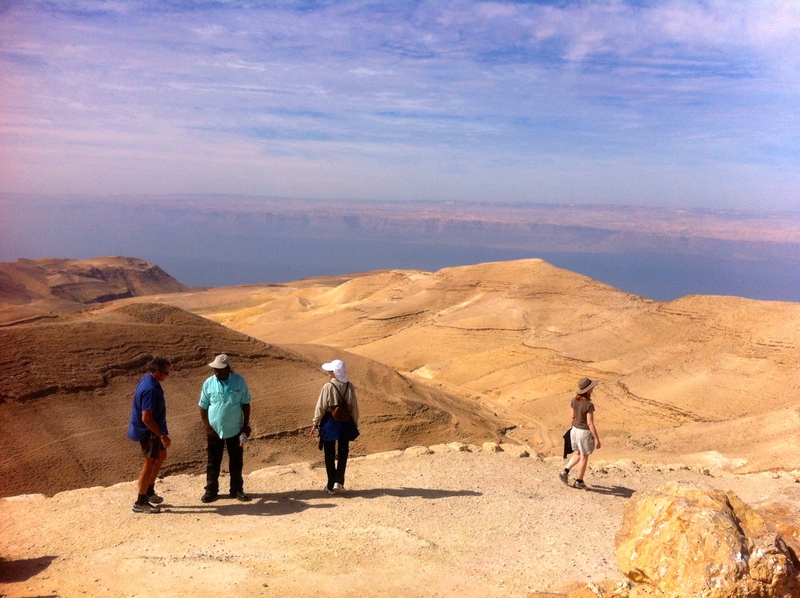 We started by climbing up a hill to the ruins where John the Baptist was beheaded, overlooking the Dead Sea, across which we could see Jerusalem. Not a bad start for our first time outside of Amman! The Dead Sea from Makawer. Jerusalem is visible on the horizon from here. 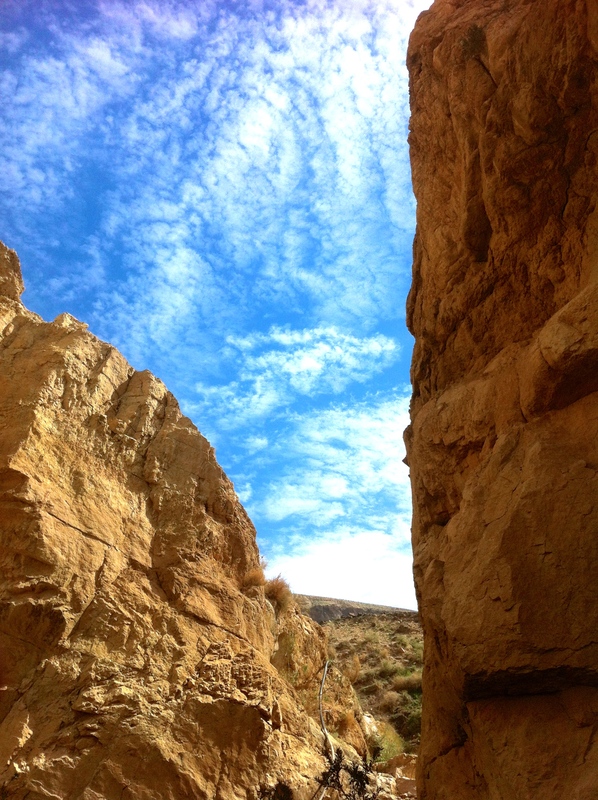 A friend told us about Experience Jordan, which leads weekly walks outside of Amman, as well as longer trips around the country and region (which we will definitely look into). 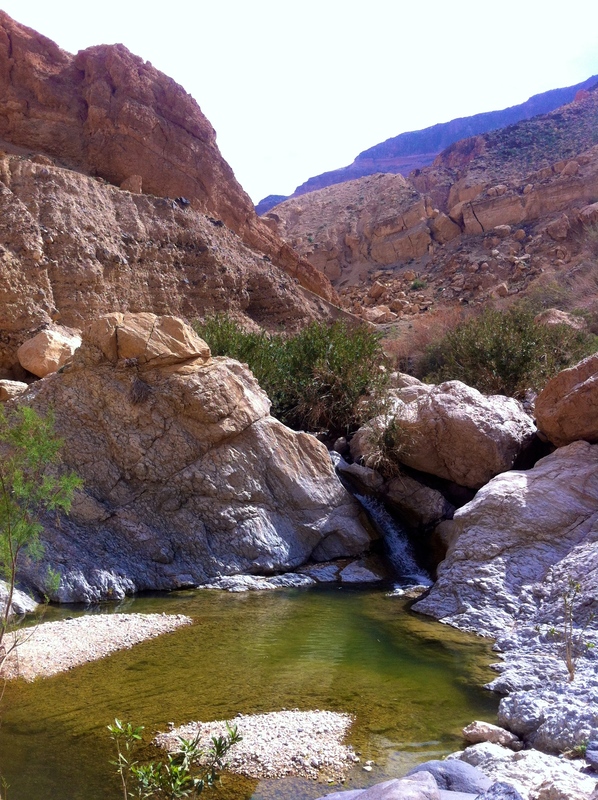 This week’s walk was to Wadi Zarqa Ma’in (wadi means valley in Arabic), via Makawer. Makawer is where John the Baptist, who is said to have baptised Jesus, was imprisoned and beheaded. We explored the caves in the side of the hill that served as his prison, after a short, steep climb up to the ruins of the palace where he lost his head. 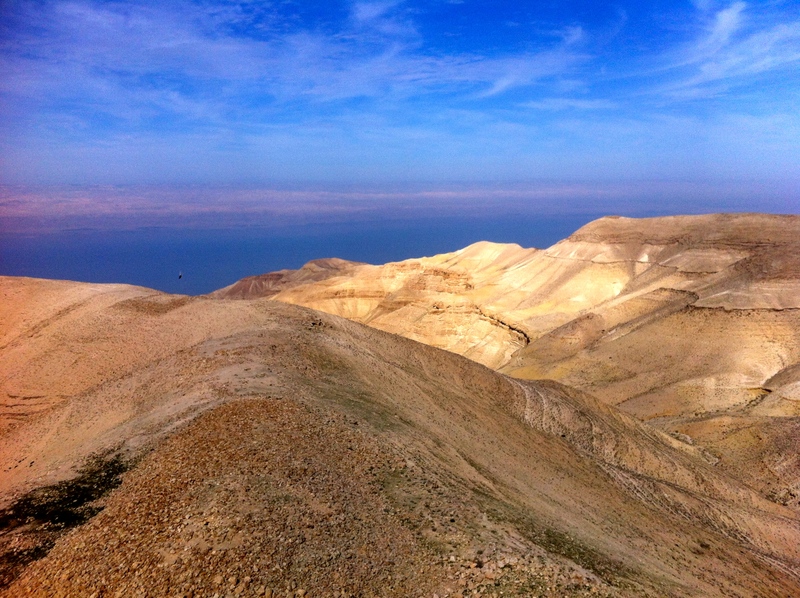 From the ruins, built in 90BC, we could see across the Dead Sea and all the way to Jerusalem. It was incredible. 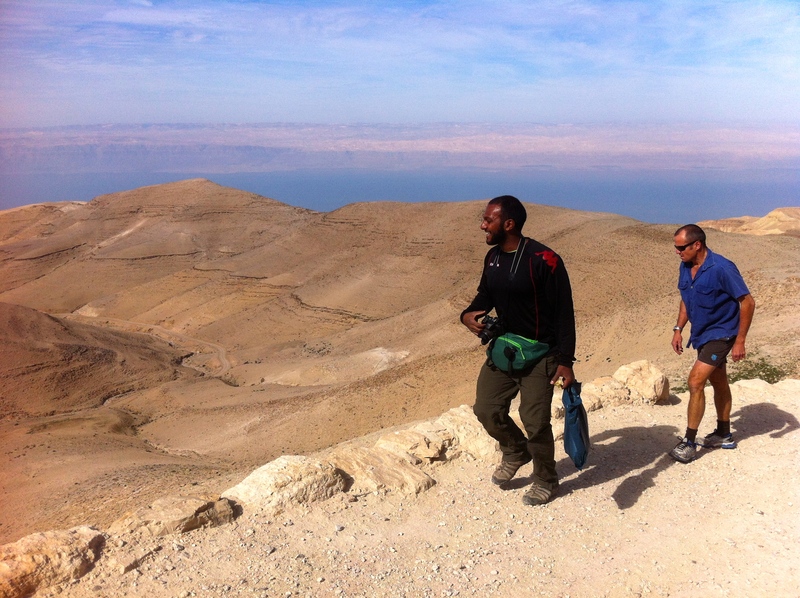 We then headed to Wadi Zarqa Ma’in for our hike. It was classified as “easy”, with “an excellent chance of getting wet”. Little did we know that this would mean swimming up to our necks across pools at the base of small waterfalls in order to clamber/be dragged up the cliffs and rock faces on the way up. But as one of the other hikers said, if we had known how wet we’d get, we may not have gone. We’re so glad we went – it was fantastic! 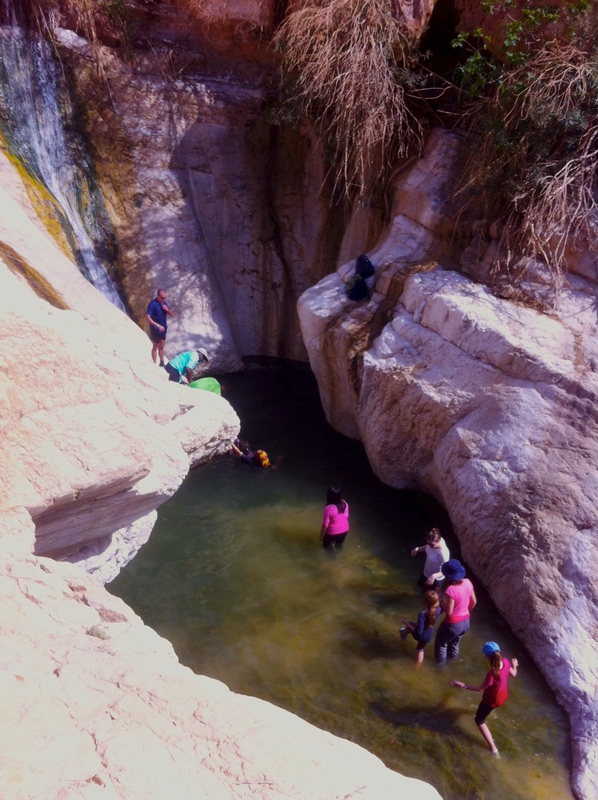 We walked by some hot springs where a number of Jordanian families were swimming and picnicking. Unfortunately quite a few of the groups were leaving their rubbish all over the place, much to everyone in the group’s disgust (especially the Jordanian guides, who are avid hikers). One lot of picnickers had a UNHCR tent. Someone explained it was likely to have been sold by Syrian refugees from the camps when security was less tight. As rational a scenario as that seems, Sam and I were quite shocked, given how symbolic the UN symbol is for us. We would never have imagined that someone would use a UN tent for a leisurely weekend picnic, making us realise how different our views (personal and in the West more broadly) of the UN and other aid organisations could be from those in the region. Just because the UN is an internationally recognised organisation, it is not necessarily seen in the same light across the world. Even if people do have a similar level of respect for the organisation, it does not mean that they will have an issue displaying its logo completely out of context. Perfectly logical, but not something I’d thought about before. Anyway, the walk. The walk was beautiful. It’s not what I would have classified as an ‘easy’ or ‘leisurely’ walk, but then, that would have been boring. We spent most of the time jumping across rocks, climbing up the side of the valley, or, as I mentioned, wading and swimming. It was actually refreshing (read ‘cold’, because I’m a wuss when it comes to water temperatures). We also passed a young shepherd and his herd of goats, which wandered up the cliff-sides as sure-footed as, well, goats. ← The best discussion on Australia’s ‘boat people’ problem yet.